Mucked about by the tidal information in the Sound of Eigg. As Ian and I set across the Sound of Eigg towards Muck the ebb tide was already running like a river in the channel between between Eigg and Eilean Chathastail. 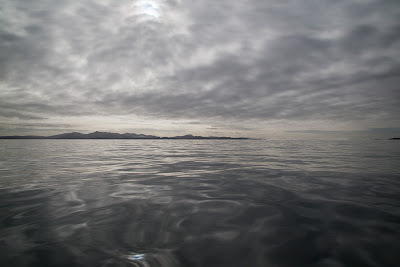 We knew (from the Admiralty West Coast Pilot) that we would be in mid channel at the peak of a big spring tide that would be travelling at 3 knots to the SE, increasing to 4 knots as we approached the west coast of Muck. As a result we set off on a high ferry angle to the north but when we stopped in mid channel, the tide was only running at 0.6 knots! The marbled sky was reflected in a mirror sea. 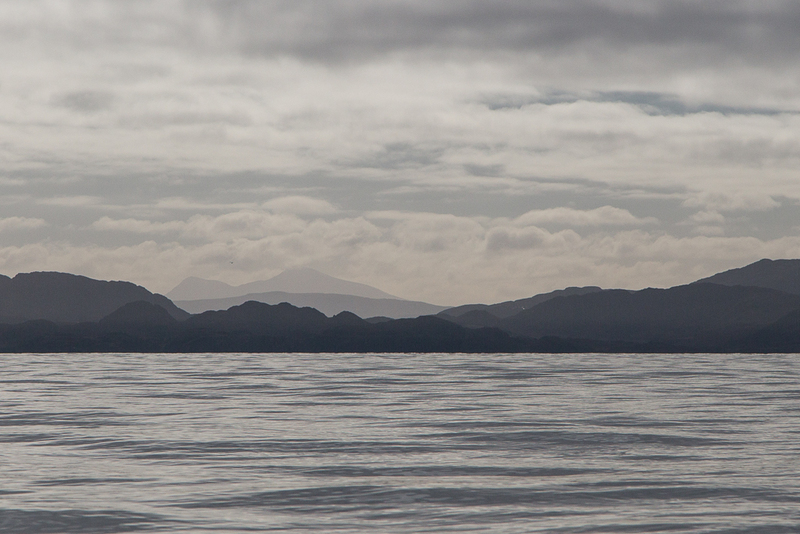 Between the two the Ardnamurchan peninsula stretched away as far as the eye could see. It was only 12 days previously that we had paddled that coast with Mike but it seemed such a long time ago. 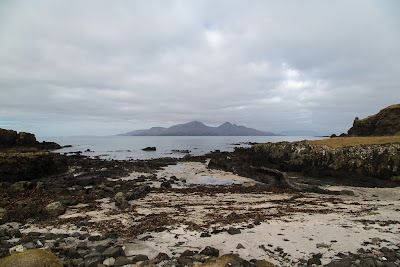 Gradually we cleared Eigg and the Rum Cuillin were revealed. In the distance Canna could be seen to the lefdt of Rum, some 30km to the NW. 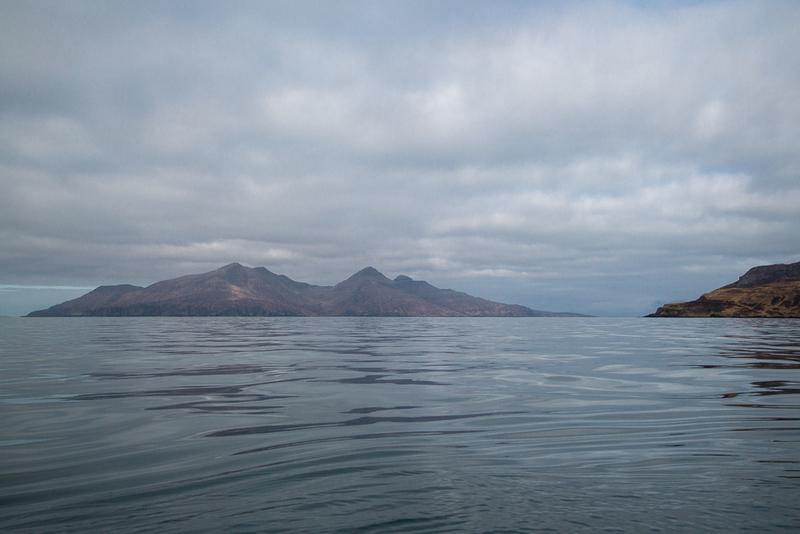 As we crossed the Sound of Eigg we slowly began to make out the Arnamurchan lighthouse at the end of the peninsula. 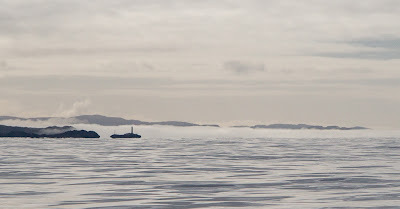 It was silhouetted against Mull by a fog bank which was lying in the Sound of Mull. To port, Ben More on Mull rose above the lower Ardnamurchan Hills. To starboard the complete profile of Rum could be seen as we left Eigg behind. 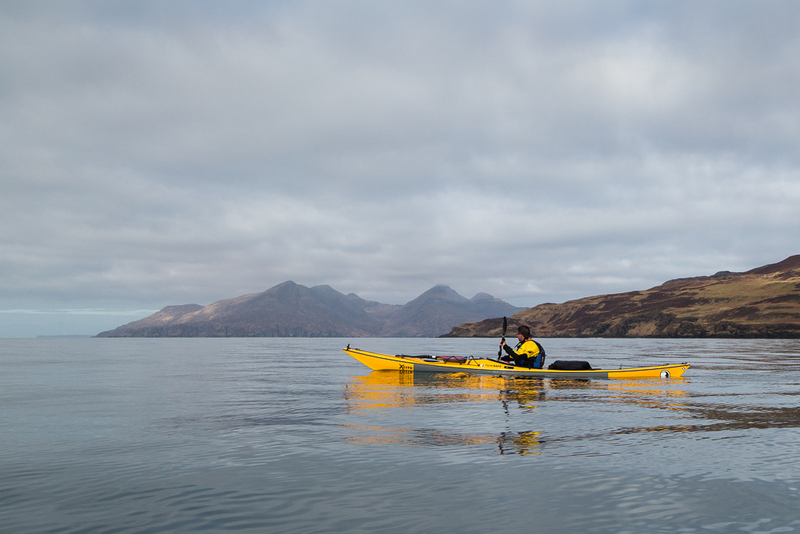 As we approached the west coast of Muck, we still expected to meet a significant tide but it never materialised. 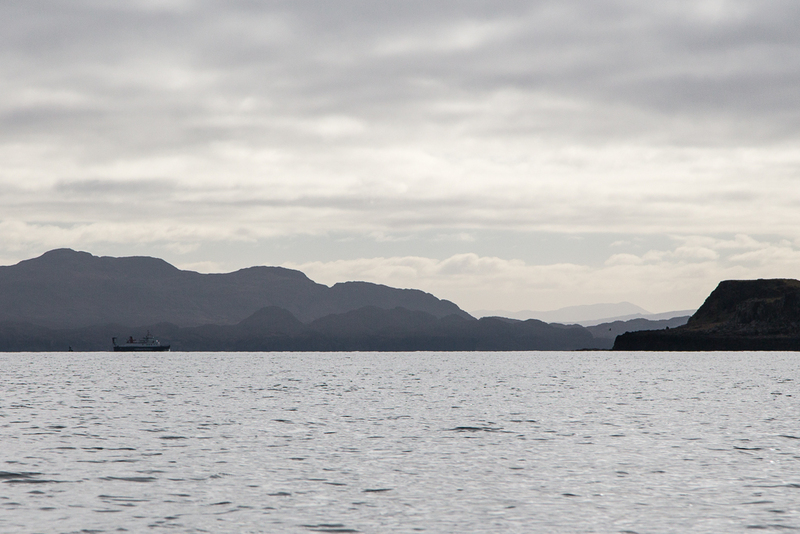 To the south the MV Loch Nevis was heading for the jetty at Port Mor on the south side of Muck. Given the highly favourable conditions (it was winter!) 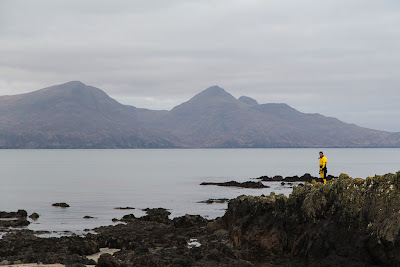 we decided to leave Port Mor till later and circumnavigate Muck in an anti clockwise direction..
...but first it was time to take first luncheon in the delightful bay of Camas na Cairidh, we had arrived on Muck. The machair to the right of the beach has a permanent composting toilet and in summer a yurt is erected, which can be rented from Isle of Muck farms. 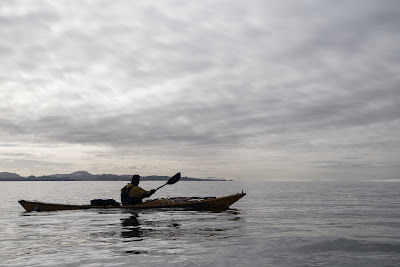 The tide was still ebbing and as it fell (leaving our kayaks high and dry) it revealed an old fish trap that had been built from a stone wall between rocky outcrops. Camas na Cairidh in Gaelic means "bay of the weir". 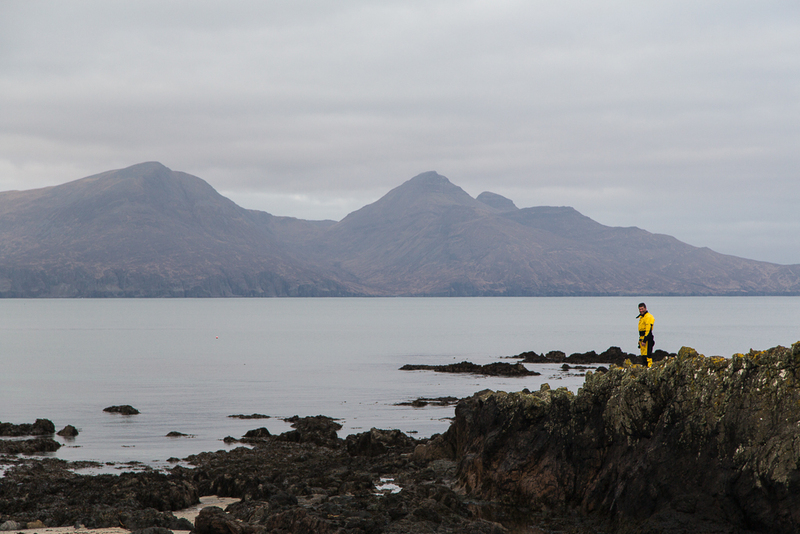 We enjoyed a superb view of Rum from our chosen luncheon spot. After warming homemade soup and bread, washed down by some 10 year old Jura or 12 year old The Singleton (I can't remember which, maybe it was both) it was time to make our way back down the rocks. 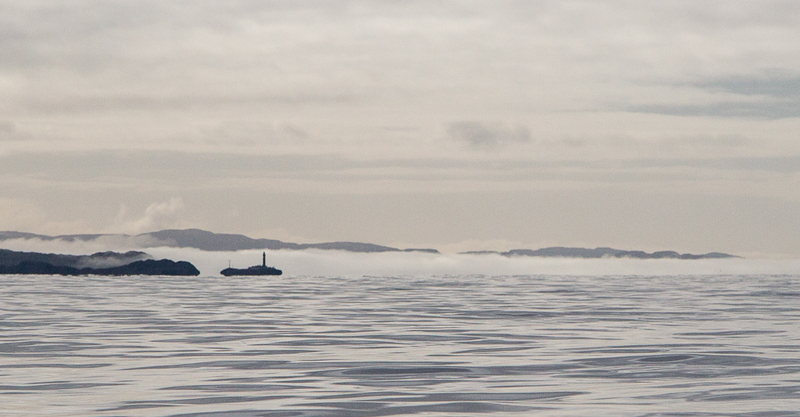 There was just time to float the kayaks over the fish trap. As we waded through the pool behind the wall it was obvious that there was not a single trapped fish. Maybe it was because it was winter, maybe the seas are empty. Fish traps like this have been used for thousands of of years and in the past the seas were full of shoals of herring.